For many of us, the weather is finally starting to show some signs of warming up a bit, but until the warm weather of Spring fully emerges again, this Ham, Corn and Potato Chowder is the perfect soup to keep you toasty and warm. As the sun starts to go down in the evening, a certain chill begins to take over the air and we are reminded, yet again, that winter is not quite done with us. As much as I’m excited about the signs of spring in the air, I’m also happy that we still have a few more weeks of hearty soup weather. 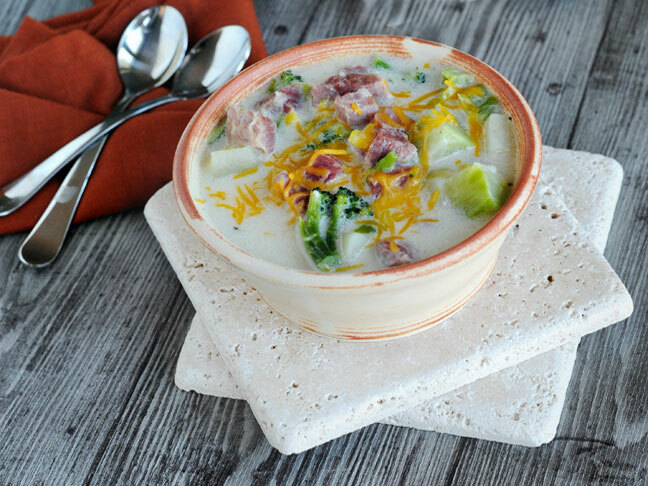 This Ham, Corn and Potato Chowder is the perfect “take the chill off” dinner. Place it in your slow cooker and let it simmer all day, then come in out of the cold and let this Ham, Corn and Potato Soup warm you up! 1. Place the diced ham through the potatoes into a large slow cooker. Stir until all ingredients are incorporated. Cover and cook on medium heat for 6 hours. 2. 15 minutes before serving, place flour and half and half into a bowl with a secure lid. Shake until flour and half and half are well blended. 3. Turn the heat of the slow cooker to high, slowly pour in the half and half/flour mixture, stirring continuously. 4. Add cooked corn and broccoli florets to the slow cooker. Cook covered for 10 additional minutes. 5. Remove bay leaf. Ladle chowder into individual serving bowls and garnish with shredded cheddar cheese.